If you keep talking about something I’ve never had before, I’ll end up making it. When I lived in ArTech with my great friend Charles, we used to get Chicken Tikka Masala either the fast food way at the corner store, or at our favorite restaurant. Some default to pizza. We defaulted to Chicken Tikka Masala (or cheesy sticks from WestCoast) so often we called it CTM. Does it get old eating the same thing? Not CTM, but I doubt your body can keep up with all that fat. Anyways, I’ve been hearing about curry burritos from my friends who work in San Francisco, and being that I had CTM leftovers (made at home), I made an attempt at that burrito. And it was great! For the CTM, keep in mind it’s just a sauce who’s main flavors are garam masala and tomato. So sweat onions in olive oil for about 5 minutes. Then add garam masala, curry powder (a little less amount of garam masala), fresh ginger and garlic into the onions. It should be really pasty. Add tomato paste, and cook for another minute or so to cook off the raw taste. Most places blend this to make a paste, but I didn’t because I can’t. So I added about a quarter cup of chicken stock, and a can of tomatoes at this point. Cook it down for about 2 or 3 minutes, and then either add yogurt or heavy cream to taste. Garnish with cilantro and it’s good to go with naan or rice. I had CTM leftovers, so with it, I just made some herb rice that had mint, cilantro, cloves, and saffron (basic biryani). Threw in some lime juice to cut the richness of the CTM. 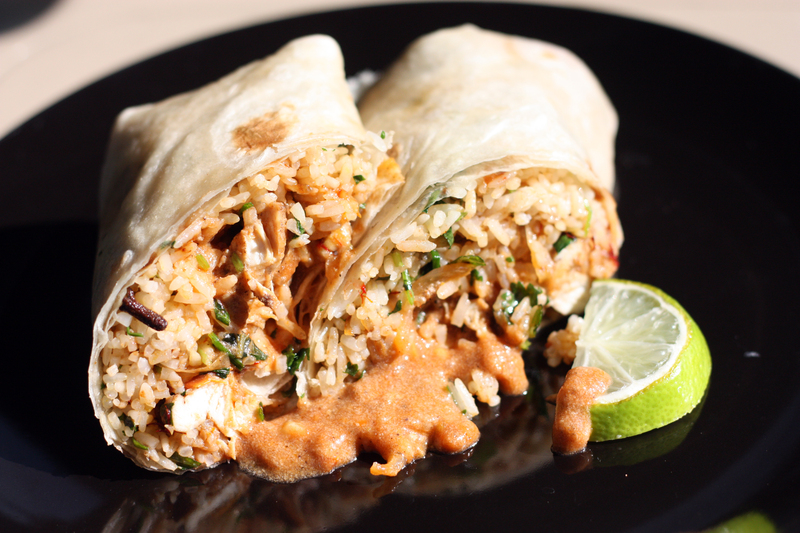 Took a portion of the rice and CTM and put it in a tortilla and made a burrito. Was it good? Oh ya, deluxe lunch. I can’t compare it to the street vendors here, haven’t had one yet. One day though. Great example of using leftovers. Try it out. Enjoy! 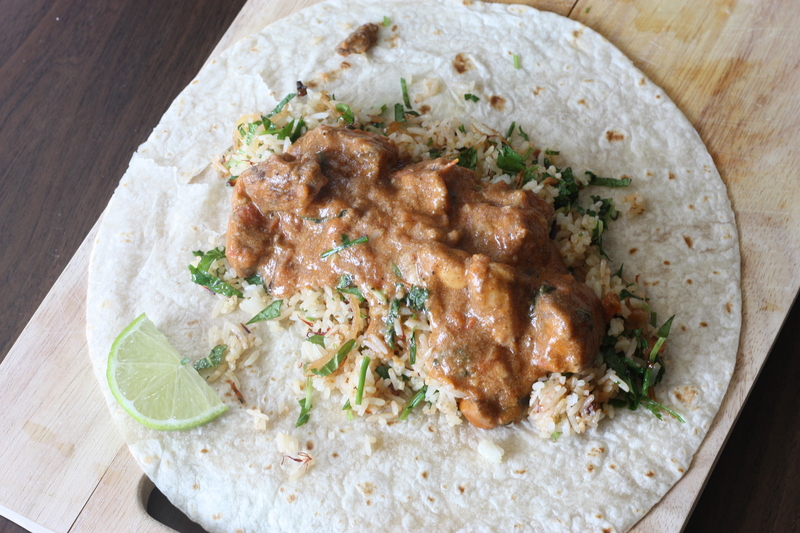 This entry was posted on February 27, 2012 by rrfoods in Lunch, Quick Nom, Snack and tagged Burrito, Chicken Tikka Masala, CTM, Curry.